When the weather is nice you like to step outside your home and do some exercises such as running, jogging or bike riding. When you do, you don’t like carrying your keys with you, but always leave them outside your house in a secret place. However, today you didn’t hide them and in fact you left them inside the house as you locked your door. Needless to say, you are now having a Home Lockout. 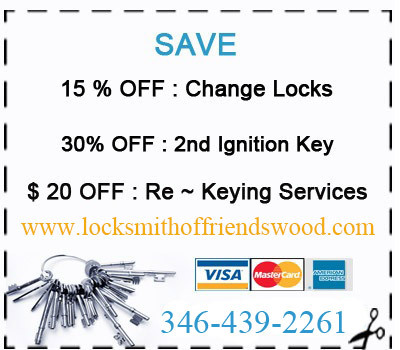 Call King Locksmith of Friendswood and shortly we will be on our way to unlock your door. Recently you bought a house and are on your way to building some equity, which your realtor said was the main advantage of owning versus renting. But one thing bothers you in your dream house; each of your doors has a different key and it is taking a while for you to unlock your door. If you want some convenience, we can make you a Master key system, which will provide you with one key for all your doors. When coming home after work you were in a hurry to get in and enjoy a cup of hot cocoa. You are not exactly sure why your lock didn’t open when you turned your key, but upon trying several times, your key broke. If you have a Broken Home Key we can make you another one.